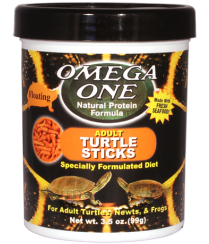 Omega One,s Adult Turtle Sticks are developed to maintain your turtle’s health and vitality at the highest levels. Made with whole, fresh ingredients and fortified with the proper levels of vitamins and minerals, you can be confident that this adult diet is the best and most complete in the world. Whole Salmon, Whole Herring, Halibut, Wheat Flour, Wheat Gluten, Whole Kelp, Lecithin, Astaxanthin, Zeaxanthin, L-Ascorbyl-2-Phosphate (Source of Vitamin C), Natural and Artificial Colors, Vitamin A Acetate, Vitamin D3 Supplement, Vitamin E Supplement, Vitamin B12 Supplement, Riboflavin, Niacin, Pantothenic Acid, Folic Acid, Biotin, Inositol, Tocopherol (Preservative), Ethoxyquin (Preservative).